Adavi Donga is difficult to really capture in mere words. As I watched it, I kept wondering if Chiranjeevi was already the Megastar, because this is not the kind of film that I imagine would really enhance an actor’s reputation. This was an adventure without subtitles, but the visuals speak volumes. My copy is a dodgy quality VCD so my images will not do it justice, but I have sourced some short clips to help bring Adavi Donga to life. No dear reader, don’t thank me yet! 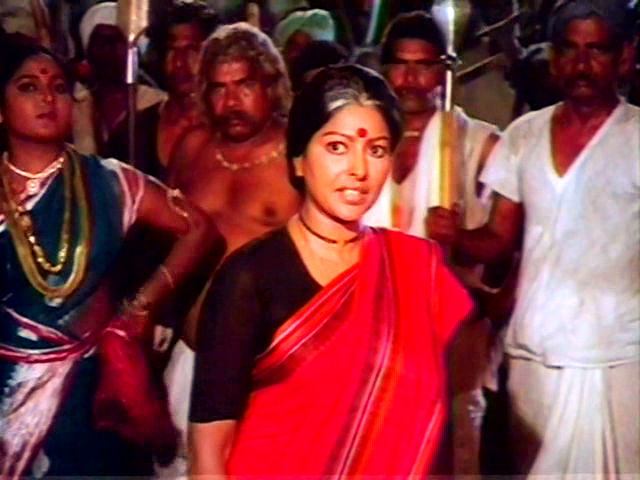 Sharada, always so elegant and striking, is Vasundhara. She opposes the local bad guy, animal poacher and underpayer of vegetable growers, Rao Gopal Rao, and his idiot son. He is slimey and not always just in the comedic manner you might expect from the wigs. Look at what happened to the last person who crossed him! And consider the well appointed lair and excellent lighting effects. He also has a gang of brightly attired poachers, and Allu Ramalingaiah as a shady advisor and factotum. Rao Gopal Rao frames Vasundhara’s husband for murder, and at the dramatic height of that incident, she stashes her recently tattooed infant son in the forest fully intending to come back when it is safe. Unfortunately for her, the lad is discovered and adopted by an elephant and taken into the jungle. I was delighted to find that the jungle was populated by lots of exciting animals like tigers, lion cubs, monkeys, antelope, peacocks and… fluffy white bunnies. Some things made me question where the rabbits fit into the food chain. They had no protective camouflage or colouring – Stupidity or fearlessness? 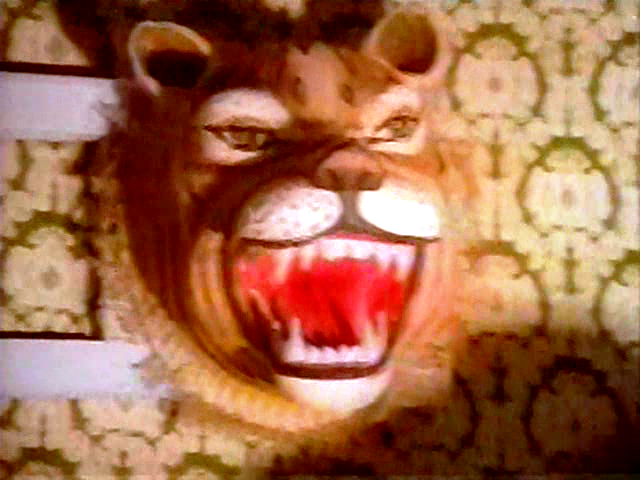 Were they just a convenient snack for local carnivores or something more sinister? Sharada is left alone and angry. Vasundhara is a strong woman with a vengeful streak tempered by her principles. Her policeman brother, played by Kongara Jaggaiah, refuses to believe that her husband is innocent and doesn’t seem too fussed about the lost baby. Of course the boy grows up to become Chiranjeevi, a Tarzan character with a wardrobe comprising several loincloths and an array of matching sandals, who lives completely unnoticed in the not very distant jungle. Radha has some strange ideas about jungle appropriate attire, although I guess pleather would be fairly hardy as fabrics go. The poacher gang try to kidnap her, possibly in an attempt to force her to marry the idiot son. But Chiru cannot resist the piercing shriek of a maiden in distress and comes to her aid. She flees, leaving her cassette recorder behind. And that changes everything. I liked that the elephant mother seems appalled to find her human child dancing to some random disco rubbish. Sadly the damage has been done and Chiru goes in search of the pretty lady. This choice leads him into a world of floral curtains and scary reflections. Radha certainly liked what she saw. The yodelling over Chiru’s arrival in this song is quite marvellous. Someone took their Tarzan tribute seriously. Radha staged another incident to attract Chiru’s attention. She didn’t count on being chased into the jaws of a crocodile by a lethargic tiger, and of course Chiru arrives in the nick of time having been alerted by her robust screaming. I do like a good crocodile wrestling scene! He takes her to his treehouse and she seems to recover quite quickly considering her leg had been gnawed half off. But why didn’t Radha seem to notice the rabbits hopping all around her? 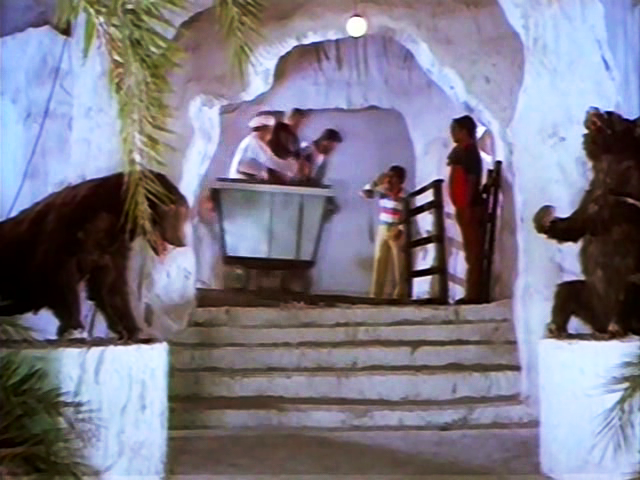 Chiru’s treehouse had an elephant operated elevator which at first surprised me – I mean, Tarzan needing a lift? How many city gals did he bring home? But then I realised the lift was possibly for the benefit of the bunnies who were sharing the penthouse treehouse with Chiru. Did the elephants have their own interpretation of bunny rug? What was their purpose? How on earth did the rabbits persuade so many creatures to do their bidding? Why do I care ? 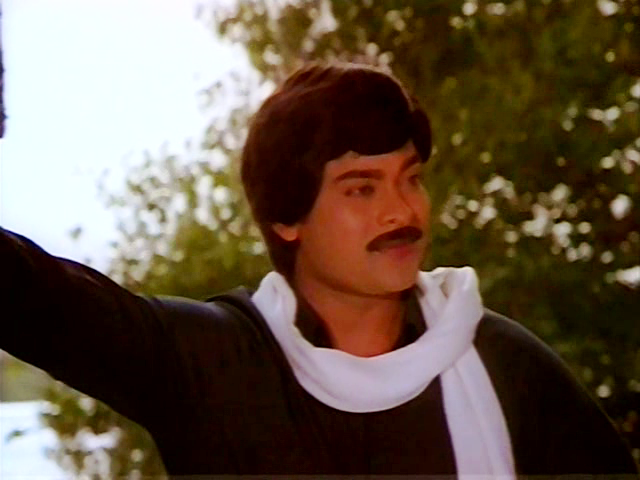 Chiranjeevi’s idea of flirting with Radha is amusing rather than smouldering. He steals her bra, covers himself in a leopard skin and crawls around growling, gets his monkey to take a Polaroid of Radha while she is changing clothes and generally behaves like a hormonal teenager. The romance between Chiru and Radha draws the attention of Rao Gopal Rao. 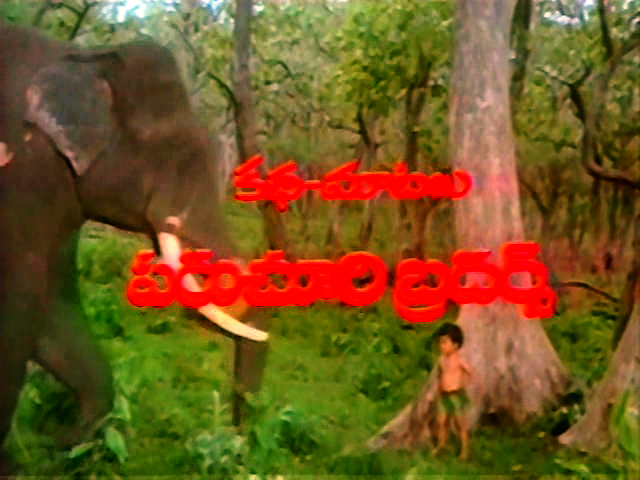 His machinations place Chiru in danger, which allows for some excellent vine-swinging, and the elephants intervene to go find Sharada and reintroduce her to her son. Quite why it took so many years to do this is not clear, but maybe they just weren’t ready for him to leave home. It took Radha, resplendent in pleather pedal pushers, to reunite the family with a clever visual demonstration of the parent child relationship. 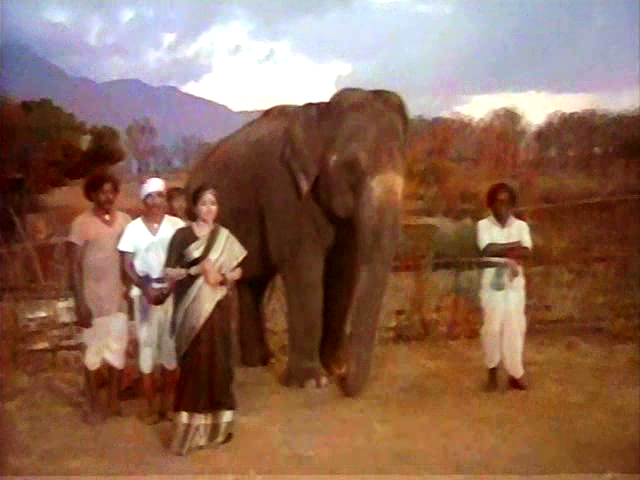 They quickly adjusted to this new family dynamic and the elephants helped Sharada break Chiru out of police custody. She is a very resourceful woman. 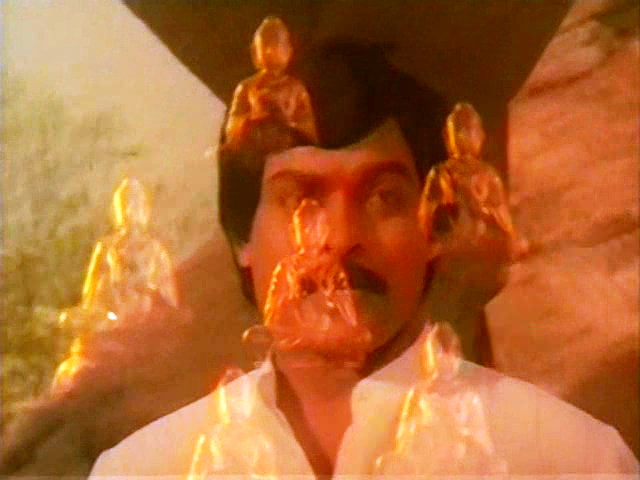 After a bit of divine intervention and maternal coaching, Chiru becomes Kalidasu. He starts wearing suits and accessorising with scarves. He also quickly develops an amazing mastery of rhetoric. Sharada imbues him with her own strong principles and he is the perfect son. She is still crusading against the poaching and other villainous goings on. I liked the villains lair, apparently accessible only via secret rail tunnel, or the truck loading bay. Despite all the secrecy, Sharada and the local ‘tribe’ seem to be able to wander in as they please. 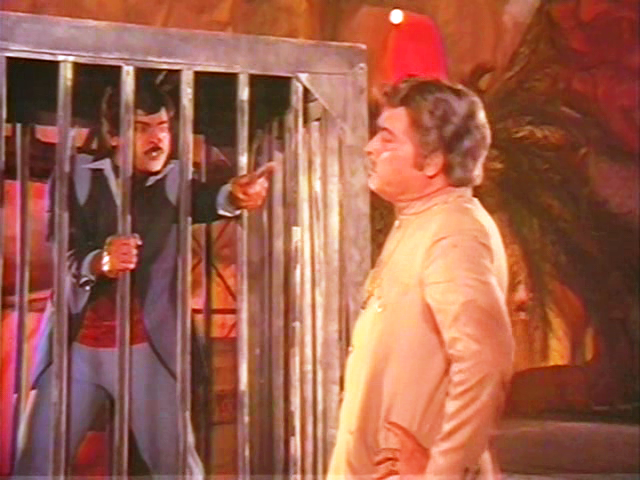 Naturally the bad guys refuse to be warned off by Sharada or by Chiru. He is outraged at seeing his former jungle friends sold for skins and tusks, although he was no tree-hugging conservationist in his previous jungle existence. An assassin is sent to kill him. 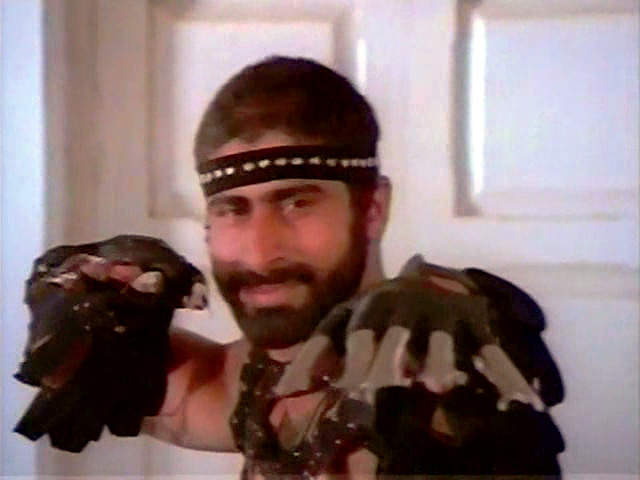 This role, if not the outfit, would have been perfect for Bob Christo. Please pay particular attention to the Wolverine style claws made from apple peelers. Other pleasing details include the abundance of fake ‘taxidermy’ in the villain’s house. What were they thinking? The commitment to that theme continues into a song. The songs (music by Chakravarthy) are kind of fabulous and completely excruciating. 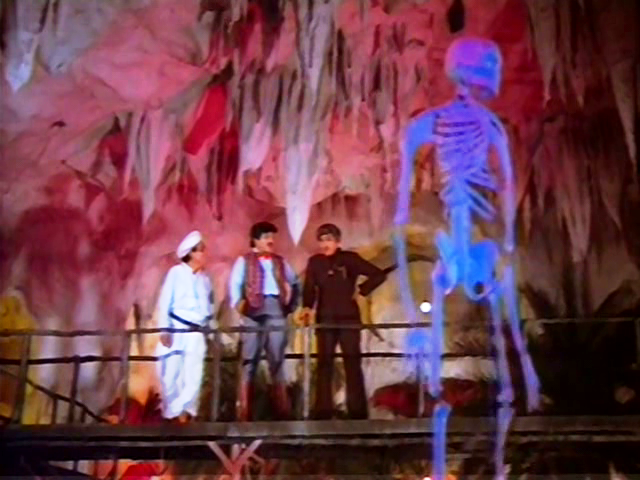 The final showdown takes place in the villain’s lair and poor Chiru is faced with a terrible dilemma. Rescue his recently freed father from this? Or save his mother from this? And how to help anyone when he is trapped? And with evil henchmen tearing his clothes off?!? Oh the humanity! Director K Raghavendra Rao wraps things up neatly, if not terribly sensibly, and there is excellent utilisation of the elephants. There is so much fabulous wardrobe, a ridiculous plot that merrily disregards any inconvenient logic, and very appealing performances by Chiranjeevi and Sharada. A must see for Tarzan fans, Chiru fans, rabbit fans and anyone who ever wanted to know which sandals go best with a loincloth. While not a great film, this is So Bad It’s Really Very Good. 3 stars! This entry was posted in Tollywood and tagged Adavi Donga, Adventures without subtitles, Allu Ramalingaiah, Chiranjeevi, Chiru, K Raghavendra Rao, K. Chakravarthy, Kongara Jaggaiah, Radha, Rao Gopal Rao, Sharada, Telugu, Tollywood. Bookmark the permalink. I am sure I have comments, but I am too overwhelmed to formulate them. Let me just say, then: I am so glad this film exists and that you have told us about it so evocatively and lovingly! Well, I’m definitely a fan of the last 3, so I’ll move this to the top of the “must watch” list. It makes complete sense that the henchman would rip his clothes off, since the loincloth-wearing avatar is much more interesting than the ascot-wearing version. Hi Liz. I think you’ll find a lot to like! 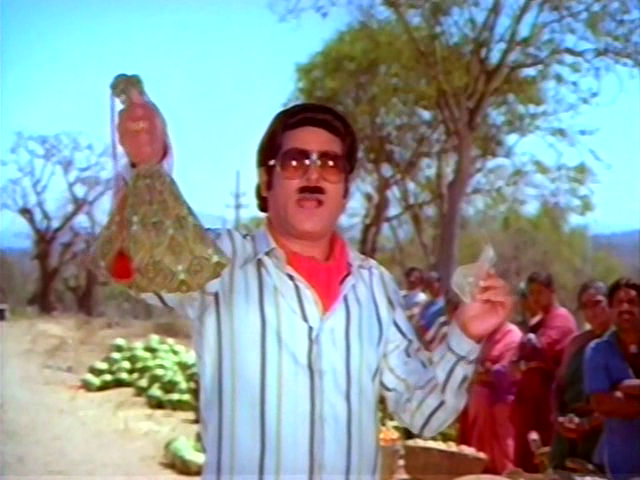 The henchmen do leave Chiru his (very tight) trousers and a scarf. I don’t want you to be disappointed. But prior to his conversion, he does sport several different loincloths so the overall ratio is about right. I have been reading your blogs for some time now. This is my first comment. Do you like Shabana Azmi? I will tell you something about this fake intellectual(anyone who talks smugly about being a “method actor” is one in my book) and so-called social activist(“I like limelight” type): She had the audacity to make fun of the great K Raghavendra Rao, B. A. (See, we can mock ourselves) while talking about the advice he gave her when she did some masala movie with him. Also, why was Tannishtha Chatterjee invited to host Asia Pacific Academy Awards held on November 26,20/11 in the Gold coast of Australia? Is it because she played an adultress (sorry, bored housewife) in the movie Brick Lane? Does it make her a “bold” woman you folk can relate to? Don’t we Indians and the rest of desis have a right to showcase only our positive side to the rest of the world? (Just like you folks-watch Australia Network if you don’t follow what I mean) Are we still a nation of snake charmers in the imagination of your fertile brains? I love your review and i really want to watch this film now. Do you know where I can watch the full movie with English subtitles? Thanks!